Pretore by Jacques Grasset de Saint-Sauveur. A praetor was one of the greater Roman magistrates with imperium or legal power. They led armies, presided in law courts, and administered the law. Judging matters between citizens was the job of one specific magistrate, the praetor urbanus (city praetor). Since he was in charge of the city, he was only allowed to leave the city for a period of up to 10 days. For matters outside Rome, the praetor peregrinus settled cases among foreigners. Over the years, they added additional praetors to handle matters in the provinces, but originally, there were two praetors. Two more were added in 227 B.C. when Rome annexed Sicily and Sardinia; then, two more were added for Hispania (Spain) in 197 B.C. Later, Sulla and Julius Caesar added even more praetors. A costly responsibility for the praetor was the production of the public games. Running for praetor was part of the cursus honorum. The rank of praetor was second only to the position of consul. Like the consuls, praetors were entitled to sit on the honored sella curulis, the folding 'curule chair,' traditionally made of ivory. Like the other magistracies, a praetor was a member of the senate. Just as there were proconsuls for the period after their year as consuls, so there were also propraetors. Propraetors and proconsuls served as governors of provinces after their terms in office.
" Let the praetor be judge of the law in private actions, with power of passing sentence-he is the proper guardian of civil jurisprudence. Let him have as many colleagues, of equal power, as the senate think necessary, and the commons allow him." "Let two magistrates be invested with sovereign authority, and be entitled praetors, judges, or consuls, in respect of presiding, judging, or counselling, according to the nature of the case. Let them have absolute authority over the army, for the safety of the people is the supreme law. This magistracy should not be determined in less than ten years-regulating the duration by the annual law." Before Sulla added functions, the praetor presided in cases of quaestiones perpetuae: the cases of repetundae, ambitus, majestas, and peculatus. Sulla added falsum, de sicariis et veneficis, and de parricidis. 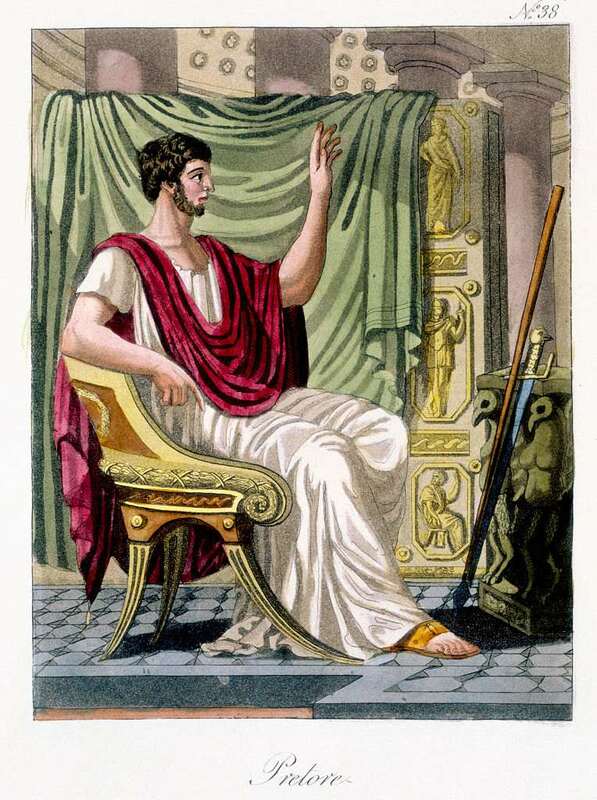 About half of the candidates for praetor during the last generation of the Republic came from consular families, according to Erich S. Gruen, in The Last Generation of the Roman Republic. The praetor urbanus P. Licinius Varus fixed the date of the Ludi Apollinares. Were Roman Dictators as Bad as They Seem? How many of these Roman terms do you know? What Were the Ludi Scaenici that the Romans Performed?